Another interesting Move Mailbox error and in this case I am really unsure how this would be possible! 1-10-2011 11:49:18 [The Exchange Server] A corrupted item was encountered during the move operation. The item wasn't copied to the destination mailbox. <errormessage>Message (size 36.83 MB (38,621,879 bytes)) exceeds the maximum allowed size for submission to the target mailbox. 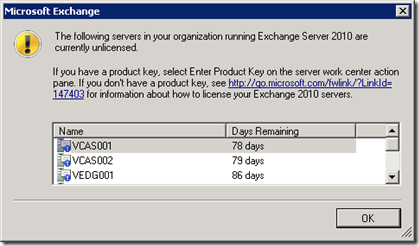 You can increase this limit by using the Set-Mailbox cmdlet in the Exchange Management Shell. This error occurs because of a size constraint just like the one in the previous part. But the strange part is that it seems to be a PST file (type IPM.Document.PSTFile) located in the Root folder of the Exchange mailbox (which is not possible AFAIK). The previous part (part 3) addressed Mailbox Size but did you know that even Message Size (or rather Item size) can prevent a successful move as well? 2-10-2011 3:18:58 [The Exchange Server] A corrupted item was encountered during the move operation. The item wasn't copied to the destination mailbox. <errormessage>Message (size 72.6 MB (76,121,694 bytes)) exceeds the maximum allowed size for submission to the target mailbox. 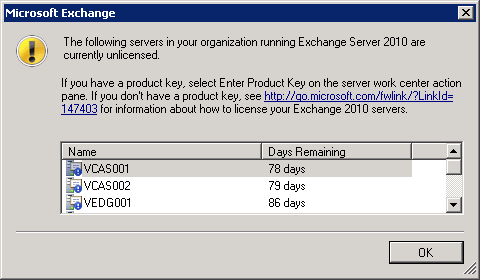 You can increase this limit by using the Set-Mailbox cmdlet in the Exchange Management Shell. As you can see in the log this mailbox there is one item with a size of 72 MegaBytes. 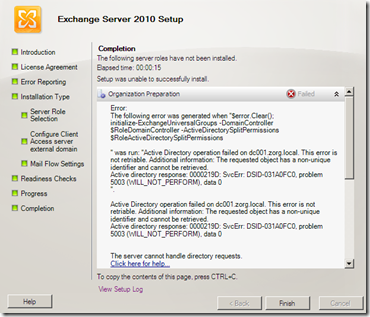 It was addresses to several internal recipients and as you know Exchange 2010 no longer supports Single Instance Storage. 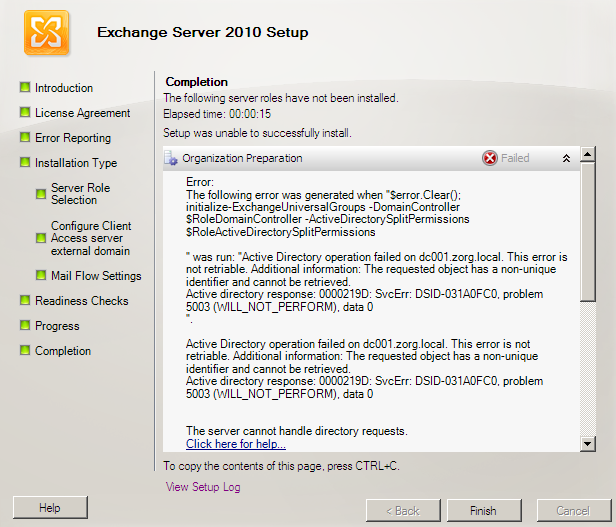 I was testing outgoing mail flow in my new Exchange 2010 setup, which should go from the CAS Servers to the Edge server in the DMZ. I verified that name resolution back and forth was ok and that I could communicate on port 25, 50389 and 50636. [06-22-2011 11:16:29.0614]  [ERROR] Active Directory operation failed on dc001.zorg.local. This error is not retriable. Additional information: The requested object has a non-unique identifier and cannot be retrieved. [06-22-2011 11:16:29.0630]  [ERROR] The server cannot handle directory requests. [06-22-2011 11:16:29.0630]  0. ErrorRecord: Active Directory operation failed on dc001.zorg.local. This error is not retriable. Additional information: The requested object has a non-unique identifier and cannot be retrieved. [06-22-2011 11:16:29.0630]  0. ErrorRecord: Microsoft.Exchange.Data.Directory.ADOperationException: Active Directory operation failed on dc001.zorg.local. This error is not retriable. Additional information: The requested object has a non-unique identifier and cannot be retrieved. I remembered from a Tweet by Helge Klein recently that the Active Directory schema has no mechanism for enforcing uniqueness of an attribute.